China has much to lose from Western turmoil. The country’s leaders may be keen to use Britain’s referendum on European Union membership to show off their relative stability: Chinese media coverage of the vote’s aftermath served mainly to remind the local population of how risky voting can be. But the growing backlash against globalisation in the developed world is a serious problem for the People’s Republic. That helps explain why China is now advocating global economic cooperation. 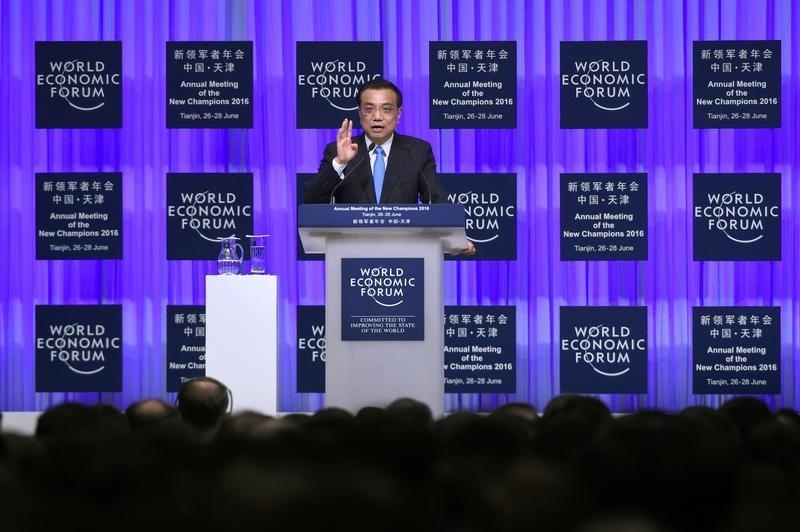 Premier Li Keqiang told the audience of dignitaries attending the World Economic Forum in the port city of Tianjin that countries needed to pull together to solve the economic problems. No single economy, he said, could shield itself from the forces at work across interconnected markets. China is quietly building international links. As markets tumbled after the Brexit vote, the Beijing-based Asian Infrastructure Investment Bank announced it had made its first four loans worth a combined $509 million. The Chinese-led institution is working with the World Bank on slum redevelopment in Indonesia and has joined forces with the European Bank for Reconstruction and Development on a road to link Tajikistan and Uzbekistan. The promise of financial support is slowly changing attitudes to China. The enthusiasm of Asian delegates for the AIIB and China’s “One Belt, One Road” project to open markets around the region surpasses their nervousness about tensions in the South China Sea. Yet sustained upheaval in the West could overwhelm these fledgling efforts. Protectionist sentiments are not confined to the United Kingdom. The U.S. electorate is flirting with Donald Trump’s isolationist policies. Even Germany – a big beneficiary of trade with China – is fretting about the possible sale of a stake in robot maker Kuka to a Chinese consumer electronics group. Meanwhile, financial market volatility strengthens the U.S. dollar, putting renewed pressure on the Chinese yuan. From Venezuela to Sri Lanka, Chinese leaders have been adept at striking deals with elites but less good at taming populist concerns or handling sudden changes of power. That’s a risk they now need to worry about in developed markets as well. Britain’s vote to leave the European Union has increased uncertainty in the global economy, and China hopes for a united and stable EU and a prosperous United Kingdom, Chinese Premier Li Keqiang said in a speech at the World Economic Forum (WEF) in Tianjin on June 27. In the first comments by a top Chinese leader since the vote, Li said China was committed to close ties with both the EU and UK. “I also want to say here that Europe is an important partner for cooperation with China, and China will continue to dedicate itself to maintaining the good development of Sino-Europe and Sino-British ties,” Li said. “Against the backdrop of globalisation, it’s impossible for each country to talk about its own development discarding the world economic environment,” he added.